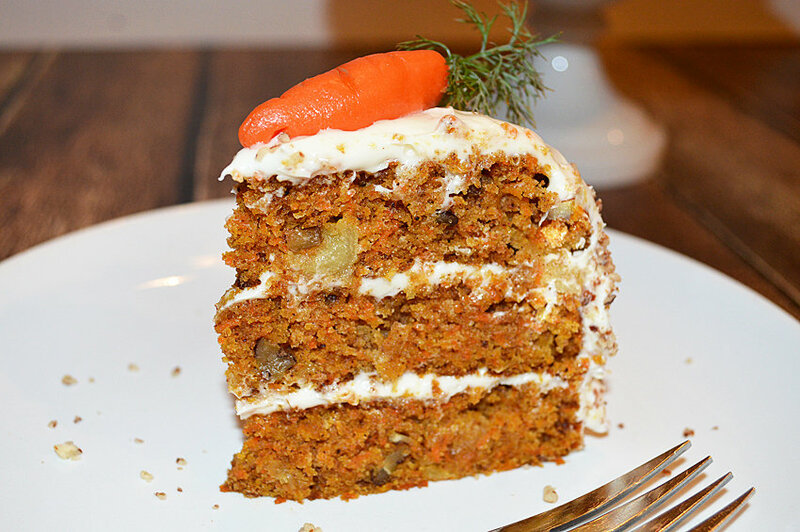 I love carrot cake and this one is no exception. It’s sweeter than most as it contains both pineapple and applesauce. But it’s moist and there’s the crunch of the pecans inside (and out). 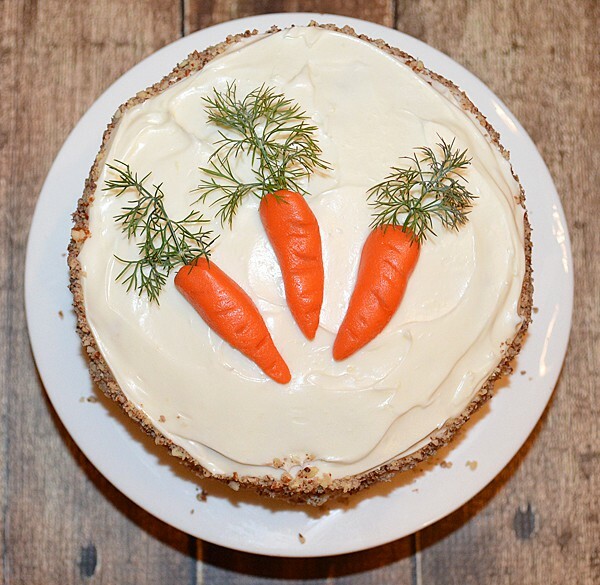 Vegan cream cheese frosting topped with homemade marzipan carrots (theres a “how-to” on that below). As with most cakes I do, this one is actually smaller than it looks. You could, of course, do this in a traditional 8″ cake pan, but here we have done three 6″ layers that are about 1″ thick. If you can find carrots with the fronds still on, you could use those on these carrots or, you could create them out of green tinted marzipan or, you could use parsley/dill (just remove it before serving). This is just for presentation. Just look at how MOIST this cake is! Chunks of crushed pineapple, crunchy walnuts….yum. I have to do my “Arizona disclaimer” here. It is unseasonably warm for mid-April so my cream cheese was not cooperating and was very soft. In hindsight, I would have made it thicker. If you live…well, anywhere but here 🙂 yours will likely be just fine! I just stuck it in the fridge to firm it up. There is lemon juice in the cream cheese frosting, so you could certainly leave that out (or use less) for a thicker frosting. 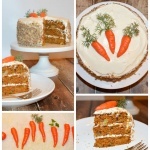 Carrots are like snowflakes…no two are exactly alike. The marizpan is very easy to work with. Let your creativity flow 🙂 And again, if you don’t want to use the marzipan, find those petite carrots in the store, steam them and just lay them on top. Alot of the time, they still have the carrot fronds attached. This recipe will make three 6" round layers about an 1" thick OR 1 thicker 8" round. Just double it if you want a second 8" layer. Line the bottoms of your cake pans with parchment and spray lightly with cooking spray. Grate the carrots and chop the pecans. Set aside. In a large bowl, whisk together the flours, baking soda, baking powder, salt, cinnamon and cloves. Set aside. In the bowl of an electric mixer, beat together the applesauce and sugar until the sugar dissolves. It should lighten in color a bit. On low speed, add the oil. Add the crushed pineapple and vanilla. Mix until well blended. Gradually add the flour mixture, mixing util just combined. With a spatula, fold in the grated carrots and chopped pecans. Evenly divide the batter in the pans and bake until a toothpick inserted comes clean, about 20-30 minutes depending on the size of the pan. Allow to col in the pans on a wire rack for 10 minutes and invert on to the rack, removing the parchment, allowing to cool completely before frosting. For the frosting, combine the softened margarine and cream cheese. Add the powdered sugar and vanilla. Add enough lemon juice to thin to a spreadable consistency. Refrigerate if necessary. For the marzipan carrots, add the almond paste to a mixer to break up. Add 1/2 of the powdered sugar to combine and then the rest. It should resemble coarse crumbs. Add the corn or tapioca syrup and combine well. It will still be crumbly. Add one drop each of red and orange food coloring and beat until combined. Turn out onto a clean surface and knead until fully combined and workable. You may need to use some powdered sugar if too sticky. Shape into a ball and then into a carrot shape. Using the back of a butter knife dipped in cocoa powder, create some indentations on the carrots as shown. With a toothpick, insert a hole where you will insert the fronds as decoration just before serving.